This is a father-son domaine producing Champagnes of the utmost integrity, and they are full-tilt YUMMY at the same time they are taken absolutely seriously by their makers. Most of the practices here will be familiar to you; fruit-thinning in July, only manual harvesting, environmentally gentle handling of the vineyards. 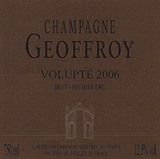 Once the grapes are harvested, Geoffroys press in a traditional Coquard press, slow and gentle, but rarely seen any more because of its low productivity and the physically taxing work it entails. Red-grape dominated cuvées from a locally warm microclimate create thrilling, vibrant, fruity Champagnes. Rich, ripe and full bodied, this is a warm, Chardonnay-dominated blend. It has crisp apple and citrus flavors, followed by a quince note and a touch of apricot. The fruit for this wine is sourced from premier cru vineyards, and it could age a few more months in bottle. Disgorged January 2012.